Having already tried the Basic, Fancy, and Improved Gin Cocktails with Genevieve Genever Gin, I wanted to find some additional drinks to use this great new ingredient. The first that caught my eye was the Amsterdam Cocktail, which I found in the CocktailDB. The orange juice is a great match with the malty genever flavor, and the Cointreau and orange bitters round out the flavor profile. This goes on the list of cocktails I can’t wait to try with other genevers as they become available. Being in the greater Seattle area, I make the occasional trek to the Zig Zag Cafe. Last time I was there, I had the fortune to sit at the bar and be served by Murray Stenson himself. Murray truly is a great bartender, both personable and fanatic about his craft. I asked him if he had any genevers on hand, and he let me try both an oude and jonge. Oude, or old, style genever has a higher content of malt wine and tends to be sweeter than jonge genever, which has less malt wine in the original distillate. Made with the jonge, this was a really refreshing, balanced cocktail. Genevieve is much sweeter than the jonge Murray used, but still makes a nice Rembrandt. 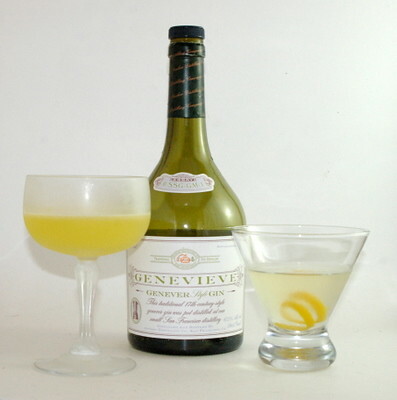 Apparently the traditional way to drink genever is straight, possibly on the rocks, so maybe that explains the dearth of genever cocktail recipes. I hope these two provide inspiration for people looking for ways to experiment with this taste that’s becoming more available to us in the US. Proost!